Too much on your plate to learn how to utilize Social Media? Learn the basics of Facebook with this informative seminar over a lunch break! Bring your laptop/tablets and learn how to create an account, find content, & schedule posts. 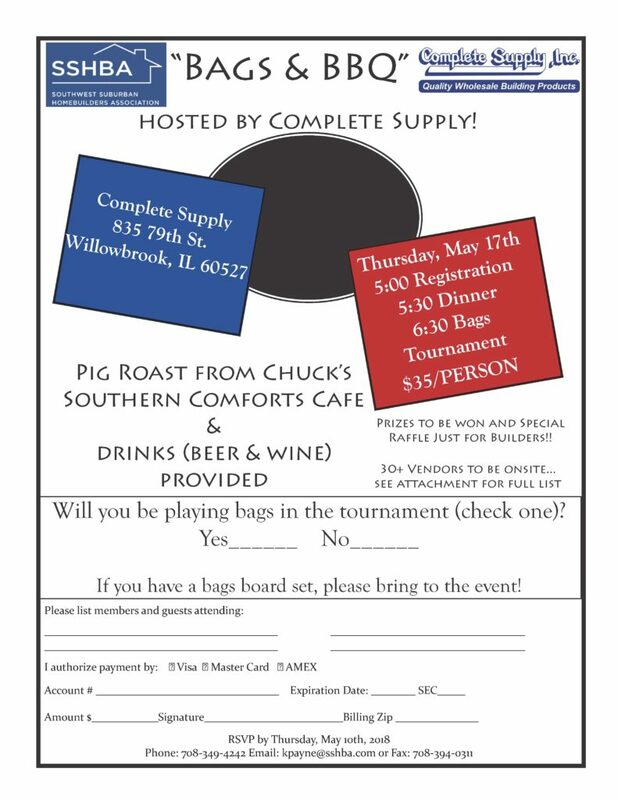 Beechen & Dill Homes, Inc.
We have a fun event coming up at one of our members’ locations in Willowbrook. They will be hosting a pig roast BBQ as well as a bags tournament! Check out the flyer and RSVP now! 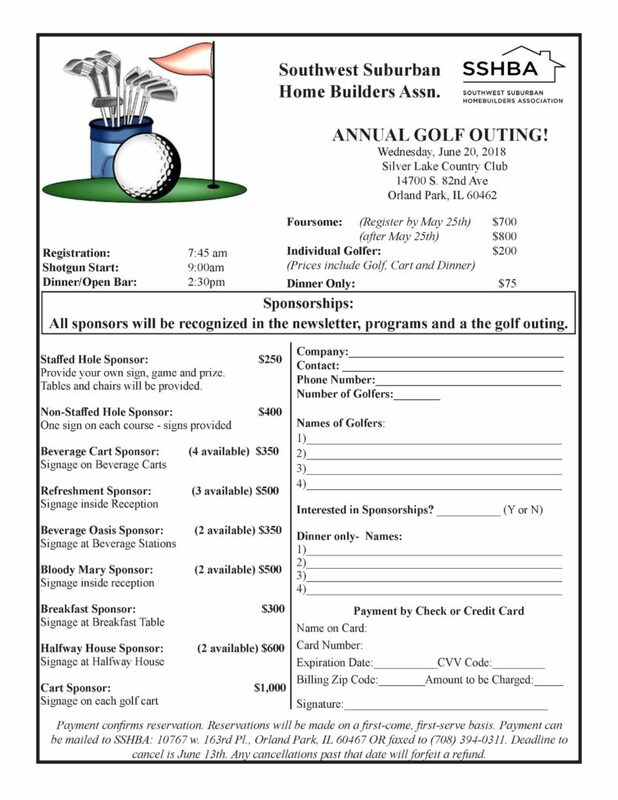 Join us for the largest event of the year….Foursomes are going fast, call today to reserve your spot! It is time once again for the SSHBA Kentucky Derby Raffle. If you are new to the association or you have not supported this event in the past, consider doing so this year. If you are one of the hundreds that have continually participated please know that your support has always been appreciated, and I hope that we can count on your continued support this year. The Kentucky Derby Raffle is one of the largest events the SSHBA hosts. For the 200 people attending in past years, the event is always very exciting, businesses flourish with many new found relationships and its most definitely full of good, old fashion “fun”. This year’s event promises to be better than ever. 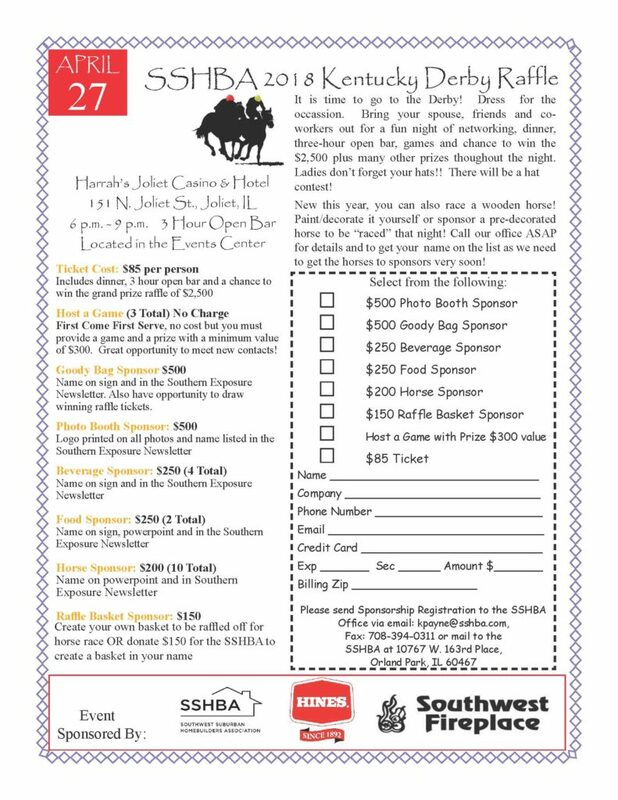 The Kentucky Derby Raffle will be held on Friday, April 27th, from 6:00 p.m. to 9:00 p.m. at Harrah’s Casino in Joliet, IL. The Grand Prize this year is $2,500 (based on a minimum of 250 tickets sold). An $85 ticket entitles the holder to a chance at the $2,500 prize, buffet, and open bar for 3 hours. This event has proven itself, year after year, to be a serious, networking opportunity to expand your business. New this year, you can also race a wooden horse! Paint/decorate it yourself or sponsor a pre-decorated horse to be “raced” that night! Call our office ASAP for details and to get your name on the list as we need to get the horses to sponsors very soon! See you on Friday, April 27th!! !